The other day at the market, a woman approached me and said, "Excuse me, but may I ask you a question?" "What do you do with that?" she asked, and pointed to the huge pile of squash in my carriage. "No, no. I know how to cook spaghetti squash. I meant that one," she said, and pointed to the only other squash in my carriage. "You mean the butternut squash?" I asked, incredulous. "Yeah. I never know what to do with them," she said. I was shocked. To me, butternut squash is like your best friend. It's always there when you need it; it's dependable and rarely disappoints; it gets along well with others and is happy to try new things. Unfortunately not everyone has a long-standing relationship with butternut squash. The woman wanted easy ideas and stressed easy. Well, it doesn't get much easier (or tastier) than roasting butternut squash with some olive oil and herbs. She agreed. And it's a wonderful addition to fall salads, soups, pastas, and pizza. I had her until I said, "pizza." That's when her eyes widened in disbelief. I got carried away in the moment. I didn't tell her I was going to use mine to bake a batch of Savory Butternut Squash Muffins with Apples, Caramelized Onions, and Cheddar Cheese. After the pizza comment, I was afraid she'd ditch the squash and run screaming from the store. So I'll share my savory butternut squash muffins with you. I have made several different versions of these muffins, but this one is my favorite. 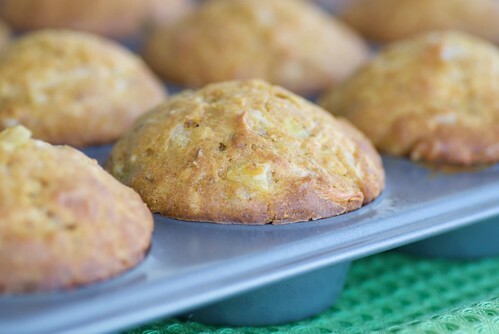 Caramelizing the onion and roasting the butternut squash gives these muffins pleasant depth of flavor. Since they're laced with fresh herbs and sharp Cheddar cheese, they're also enticingly fragrant. You could eat them plain, but why would you, when you can smear them with herb butter? They get along really well with hearty soups and chilis as well as salads. I plan on making another batch for Thanksgiving dinner because savory muffins just seem so much more festive than plain old sliced bread. Add 2 tablespoons fresh minced sage and/or rosemary to 1 stick of softened butter and whisk until smooth. This can be made ahead and refrigerated. Just take butter out about 30 minutes prior to serving. 1. Place rack in center of oven, and preheat to 375 degrees F. Spray a 12 mold regular size muffin pan with cooking spray. 2. Combine flours, baking soda, salt, and black pepper in a large bowl and stir well. 3. In a separate bowl, combine milk, honey, eggs, and 1/3 cup oil and whisk well. 4. In a small skillet over medium-low heat, warm 2 teaspoons oil. Add onions and sprinkle with a pinch of sugar. Cook for 7-8 minutes, or until tender and lightly caramelized. Remove from heat. 5. Add the dry ingredients to the wet ingredients. Whisk until combined. Fold in onions, apples, squash, herbs, Cheddar, and walnuts. 6. Spoon the batter evenly into the into 12 muffin cups. Bake for 18-20 minutes, or until the tops are golden and a cake tester inserted into the center of a muffin comes out clean. Transfer the pan to a rack to cool for 5 minutes before removing each muffin and placing on a wire rack to cool. Last week, I roasted a butternut squash from the farm, and then the food processor turned it into a wonderful puree in no time. I used it as a sauce with caramelized onions and rosemary for whole wheat pasta. Absolutely delicious! I should serve them alongside the butternut squash soup I posted this week! I love the addition of cheese. One of my fave foods in the world. Savory muffins are wonderful! That combo is perfect! Yummy! I love this! Your muffins are the perfect addition to any Thanksgiving table. Definitely a more special alternative to regular old bread! Ooh! These sound amazing! I, too, have an ongoing love affair with butternut squash. Squash, in general, is a staple in our home. Also, I discovered this year that pumpkin is just as versatile. I've made pumpkin macaroni and cheese, pumpkin soups, squash rolls, and of course the classic takes on both savory and sweet variations of the roasted pumpkin. I'll be making these muffins next week when I visit my sister for the holiday. Gorgeous Susan. These would have been perfect with our chili last night! I always love that I can peel a butternut so much easier than almost any other squash and then the options just flow out. I absolutely agree with you - butternut squash gives one so many options it's even hard to pick one. These muffins are making me hungry. This happens to me fairly often when I'm in the grocery - that people ask what to do with a certain produce item. Maybe I choose "weird" produce? Butternut, IMO, is pretty standard! I do, however, have an unnatural obsession with all winter squashes - I keep buying more than I can eat, just so I make sure I always have a bounty of deliciousness around! These muffins sound wonderful. Butternut squash is one of my favorite veggies. I almost feel sorry for that woman. These muffins look perfect. I'm going to have to whip up a batch of these babies! My whole family loves butternut squash! These muffins are simply to die for and they would go so nicely with a bowl of homemade soup. It was nice of you to help that poor woman out. Can you imagine missing out on butternut squash? Haven't tried it on pizza yet, but we love sweet potatoes, gorgonzola and caramelized onions on our pizza, so I'm sure it would be similar. 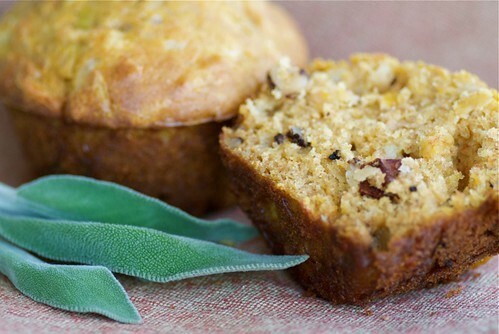 These butternut squash muffins look divine! Love it. Love the story and love the recipe! And the new pic! I would have been shocked too. Give me butternut squash any day and I'll be happy. However, I've never made muffins with it, so your recipe is very intriguing. I've made several batches of sweet butternut squash muffins in the last few weeks, but this recipe opens a whole new savory chapter in my love for winter squash! Yum!! I will make these this weekend! I've been looking for savory treats for vegetarian lil' sis. abby-SOunds like a great pairing! hilary-I haven't had as much luck with pumpkin, but now you've inspired me! And let me know how you like the muffins! tanna-These are great with chili! patricia-I hope she thought so! tasteyeatsathome-You and should talk. I have an obscene number of squash right now. megan-I know what you mean. laurie-It would be a sad life! And you've gotta try it on pizza. It's amazing! I don't have a muffin pan, so no muffins yet. However, I'm totally intrigued by the idea of butternut squash pizza... please share! I would love them!! I think butternut is the most versatile (and probably best-tasting) squash of all. Reminds me of the day I had a reader tell me that tilapia was exotic. "Tilapia? Exotic?" I thought. I can get it frozen at Walmart in a pinch if I am using it in a chowder. I guess anything I can get at Walmart is no longer exotic in my world! I fell in love with butternut squash last year.. and haven't looked back since! I have one on my counter that will likely be roasted to bring out it's yummy sweetness. Your muffins look amazing... I love that they are so savory. Wow. A combination I would've never thought about trying but now that you mention it, it sounds yum. I may be trying these next week to go with that leftover turkey. Thanks! Oh! Can't wait to try this one. I need me some squash. I think it's been almost a year since I last had any fresh ones between all my moves and such. Haha love your commentary on butternut squash! I love butternut squash in savory dishes and how ironic that I just finished off some leftover pizza from our favorite local joint - their "Harvest Moon" pie has thinly sliced butternut squash and sausage, caramelized onions, a balsamic brown sugar drizzle, a little bit of cheese and toasted pepitas. heavenly! When broads ask bout squash in a market it means they looking to get picked up not a recipe! how can you eat pasta on the same plate as salad Valli? Those look fantastic and incredibly scrumptious!! Now those are right up my alley. I've been known to add squash to all sorts of dishes, including dessert. This combo sounds great - hope that woman stumbles across this recipe one day! melanie-I will share one for pizza! kalyn-I agree. It's still my favorite squash. cari-Ha! I know what you mean. I guess "exotic" is relative. patsy-I always have a butternut squash or two on my counter too! amyj-It's really wonderful, so I hope you try it. Thanks! cara-That sounds sensational with sausage! I may have to steal that! wizzy-Thanks! They're lovely this time of year. michelle-I hope she does too! Susan, I adore butternut squash and your muffins look scrumptious. I have made savoury scones with them, will try it this way next time. I wish I would have had some of these to go with my vegetable soup yesterday! They look delicious. Not many people have this knowledge for those kinds of squashes. I just recently knew what to do with the butternut squash,too. My sister told me so. I have been stuck tot hose spaghetti squash and the like. babycrib-You're right. I think I'm going to start posting more butternut squash recipes! Oh Man... these are just delicious! I absolutely love butternut squash and I cook with it almost once a week from September through the spring. I'm doing Thanksgiving at my place this year and I stumbled upon your recipe. I just made these tonight (I hope they last until Thursday) and they are just perfect. Thank you so much for sharing! notquitevegan-Butternut squash was just meant to be paired with rosemary and caramelized onions, wasn't it? Yummy! We made these for Thanksgiving and were definitely a new keeper recipe. We'd eaten about a third of them before dinner.